Former Sussex-based defender Mickey Demetriou could have quite a job on his hands on Saturday. How do you stop a player who has scored more goals than Lionel Messi and Cristiano Ronaldo in the past year? Defender Demetriou, from Durrington, will hope to have the answer come Saturday evening if Harry Kane plays against Newport County in the FA Cup fourth round. Demetriou started his career at Worthing and is relishing the prospect of trying to produce a major cup shock when Tottenham Hotspur visit Rodney Parade. The 27-year-old has now played 104 times in the Football League with Shrewsbury, Cambridge and Newport, having gone on to play for Bognor Regis, Eastbourne Borough and Kidderminster after leaving Woodside Road. 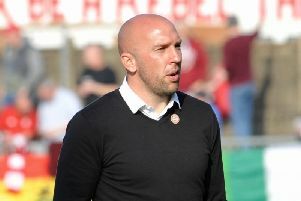 He helped Newport battle back from an 11-point deficit to stay in the Football League last season and they are now just a place outside the League Two play-off positions this year. Their reward for beating Championship side Leeds –when Demetriou walked on to the pitch with son, Theo – in the third round of the FA Cup was a home tie with Spurs and Demetriou admits cup fever has gripped Newport. Mickey Demetriou in action for Findon in 2015. Demetriou played for Shrewsbury in the League Cup against a Chelsea side who included Didier Drogba, Oscar and Mo Salah in 2014 and now he could come up against Kane, arguably the most deadly striker in world football at the moment. He said: “It will be a difficult one but you never know. I’ll be surprised if he’s playing but you want to play against top players like that to test yourself. “Hopefully he does make an appearance on the pitch and we can test ourselves against one of the best players in the world at the moment. “It will be a difficult one but we’re looking forward to that challenge. “I don’t think anyone apart from ourselves thinks we’ve got a chance. It is a free hit, it’s a nice distraction from the league and hopefully we can enjoy the day. “It’s a big day for the club. We’ll go out to enjoy it but we’ve got to play the game and not the occasion. "We play well at home, so who knows? People probably didn't expect us to beat Leeds when the draw came out but we played well against them and did that. "You don't know what Spurs team is going to come down. I'm sure they'll be resting a few players as they have four big games coming up after us, so hopefully we can catch them off guard." A draw on Saturday would see Newport earn a replay at Wembley. Demetriou has played at Lord’s, the home of cricket, with Findon in 2007, and said: “If we get a draw obviously we’ll take it back to Wembley and the club gets a big financial boost through that and it would be on TV again I’d have thought. “But you never know, if we’re lucky enough to get a win then that’s a similar financial boost to getting the draw. “We’re open-minded but being realistic. We’re playing against one of the best sides in the country at the moment and they’ve got many world-class players in their team. “It’s going to be difficult but that’s what the FA Cup is all about. You look at what Lincoln did last season, they went to Burnley and won, then went to Arsenal away and put in a performance there. After Saturday, Demetriou’s focus will be on trying to earn a second promotion out of League Two. He said: “We’re just outside the play-offs with 17 more games to play. We’d have taken that if you’d given it to us at the start of the season, compared to where we were last season.